Award-winning international architectural and masterplanning practice, JTP (formerly John Thompson and Partners), is moving its head office to the London Dock development in Wapping by St George. The architecture studio will relocate to the listed Pennington Street Warehouse in 2017. Craig Carson, Managing Director of St George City said: “We are delighted that JTP is moving to London Dock and will be the development’s first permanent commercial occupier. JTP’s recent projects include the regeneration of St Clement’s Hospital in Bow; Battersea Power Station; Bow River Village; The Hamptons in Worcester Park; West Hampstead Square; and Putney Wharf for St George. 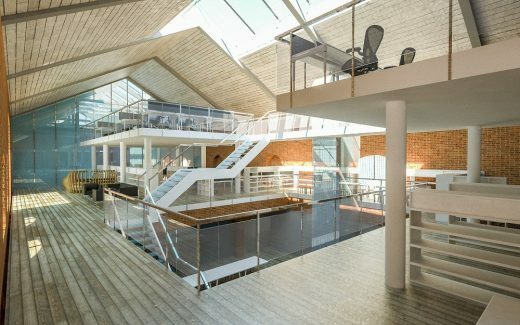 The new office will be located within the Grade II listed Pennington Street Warehouse which is being sensitively restored to accommodate a variety of uses. As part of the masterplan, new routes are being created through the warehouse onto the London Dock site providing public access to the site for the first time in over 200 years. The first route will be delivered as part of the new office for JTP. The 313m-long warehouse was built in the early 19th century as part of the former London Dock network: the first enclosed commercial docks in the capital. JTP will be moving its London team of 90 staff to London Dock and has designed the office interior to create a contemporary design studio, whilst respecting the heritage of the listed building. St George was granted planning permission for London Dock in March 2014. The 15 acre site is being transformed into a vibrant new neighbourhood with 1,800 new homes (486 of which will be affordable) and 180,000 sq ft of commercial space, ideal for the creative industries and contributing to Wapping’s growing creative quarter. The development will be set within 7.5 acres of beautifully landscaped open space, with a public square at its heart which can stage events throughout the year including local markets and concerts. The Quayside, a new pedestrian boulevard, will link Vaughan Way to Tobacco Dock activated with shops, cafes and restaurants. A 375m long Promenade will create a tranquil waterside pedestrian route connecting St Katharine Docks to Tobacco Dock and beyond. A unique art and text trail will weave its way through the public realm revealing the history and heritage of the former docks. The first residents will move into their homes in autumn 2016.